Don’t be a PANCAKE FACE Ladies!! You heard me. Pancake face. It is a serious condition women suffer from all over the world. Ladies! Unless you are performing on stage, in a cheer/ dance competition, or trying out for a lead vampires role, there is NO need for you to be wearing 12 pounds of Makeup. You know when you put on your foundation, then powder, then concealer…. and you think that looks good? Oh ya, we cannot forget about the jaw bone line each and every single one of you has when you wear that much makeup. Blend away ladies, we can all still see it. What is even worse is that at the end of the day when you take aaaalllll that makeup off and look your “natural” self, I am so sorry to say this but your face probably looks splotchy, irritated and faded. All that makeup is no good. Especially MAC. Yes, MAC is a very high quality brand, one of the best out there… but MAC is STAGE makeup…. Back before they realized they could sell to all you ladies, making you believe you NEEDED all that makeup, they were a brand used by Makeup artists to do the faces of people that would be under bright, microspcopic lights. If you are going to school, work, ect. you do not need this kind of makeup. Obvi. Sooo case and point- I was never really a huge fan of Bare Minerals until just recently. I have always used Color Science, which by the way i am still a HUGE fan of, its just hard because you have to order it online. However, I have always ordered my Color Science online at Derm Store and they always include free shipping on all orders which is amazing. Color Science offers a way bigger selection of shades than Bare Minerals, so if you haven’t had any luck finding your exact shade with them, I would definitely recommend trying Color Science. My favorite thing is the Foundation with brush in “All Even”. After you initially get the brush, which is so convenient when your on the run- you just have to buy the refill of whichever foundation powder you are using. Typically a refill would last me 4 months…. so 3 refills a year? Thats only costing you $40 per refill. which is still less than Bare Minerals. Anyways, I decided I wanted to Switch things up and after trying my friends Bare Minerals a few weekends ago I decided to take the jump. Good News though! You know with our economy in the shitter right now, there are deals galore- I ended up finding this Bare Minerals set which includes 3 brushes, 2 foundations (one a little lighter for when you unfortunately turn ghostly during the winter months), the minreal veil, bronzer AND a DIY DVD. My mom got the same set and was super excited about the dvd. haaa. Oh yes, and it includes a big bottle of the Bare Minerals Brush conditioning shampoo, which I have already used on all my brushes. The three kits come in Light, Medium and Dark. As light skinned as I am I went with Medium and it is perfect. 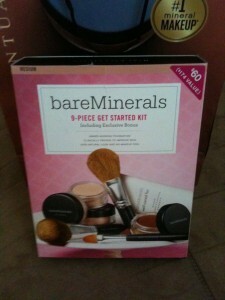 I bought my Bare Minerals kit at Planet Beauty, but I know you can get it at Nordstroms, Sephora and I am sure Macy’s. If you plan on buying it at Planet Beauty, I would recommend calling ahead, the Bare Escentuals is only sold in store and not online. Same with Nordstroms, DEFINITELY call ahead, I went over there today and they were completely out of the medium kit, all that was left was light and a few dark.